Documentation: Specimens: lapponicus (=subcalcaratus), UNSM ZM7676, 8 Feb 1889, Lincoln, Lancaster Co; alascensis, UNSM ZM7603, 16 Nov 1901, Haigler, Dundy Co.
Taxonomy: Five subspecies are currently recognized (Hussell and Montgomerie 2002), two of which occur only in Eurasia and a third only as a vagrant to western islands of Alaska. The remaining North American subspecies are alascensis, breeding from Alaska to northwest Northwest Territories and wintering south to California and east to Texas, and subcalcaratus, breeding from north-central Northwest Territories and Manitoba east to northern Quebec and northwest Labrador, wintering south to Texas and east to North Carolina. The wintering ranges of both alascensis and subcalcaratus include Nebraska, although alascensis might be expected mostly in western Nebraska. Of three specimens collected in Logan Co in the 1930s and identified by Swenk, two were subcalcaratus (24 Dec 1935 and 9 Jan 1937), and one was alascensis (31 Oct 1936) (Glandon and Glandon 1937). These specimens cannot now be located at UNSM; apparently the Swenk collections passed to the Museum of Vertebrate Zoology at Berkeley, California after his death (Thomas E. Labedz, personal communication). There are, however, two specimens of alascensis at UNSM; the one cited above, and the other, ZM7604, also taken at Haigler, Dundy Co 16 Nov 1901. There are several Nebraska specimens at UNSM labeled subspecies lapponicus, but this epithet is now used for breeders in northern Russia west to Norway (Hussell and Montgomerie 2002). We believe these latter specimens are examples of subcalcaratus. Migrants depart by mid-Apr. Peak migration is probably in Mar, according to High Counts (below). There are later reports of 50 on 23 Apr 2013 Dodge Co, 24 Apr 1995 Adams Co, 26 Apr 2010 Custer Co, 28 Apr 1951 Gage Co, 10 May 2009 Madison Co, 10 May 1975 Adams Co, and 3 Jun 1980 Scotts Bluff Co.
High counts: 11,000 in Seward Co 7 Mar 2018, 10,000 in Adams Co 22 Mar 1993 (Grzybowski 1993), “at least” 10,000 along six miles of Road in Knox Co 10 Apr 1997, and 8000 in Gage Co 14 Mar 2013. Migrants appear in mid-Oct, with earlier reports 25 Sep 1960 McPherson Co, 30 Sep 2018 Lancaster Co, 1 Oct 2005 Sioux Co, and 2 Oct 2006 Chase Co. Peak migration is probably in late Nov; large numbers seen during the CBC period often decline markedly during midwinter (see Winter). High counts: 9000 in Seward Co 19 Sep 2006, “several thousand” in Knox Co 12 Nov 2000, “thousands” in the eastern Rainwater Basin 7 Nov 1999, “thousands” in Polk Co 17 Nov 2014, 2000 near Hastings 19 Oct 1930 (Jorgensen 2012), 1680 in Custer Co 8 Nov 2018, 1204 in Cass and Otoe Cos 12 Nov 2000, and over 1000 in Platte Co 12 Nov 1986 (Williams 1987). 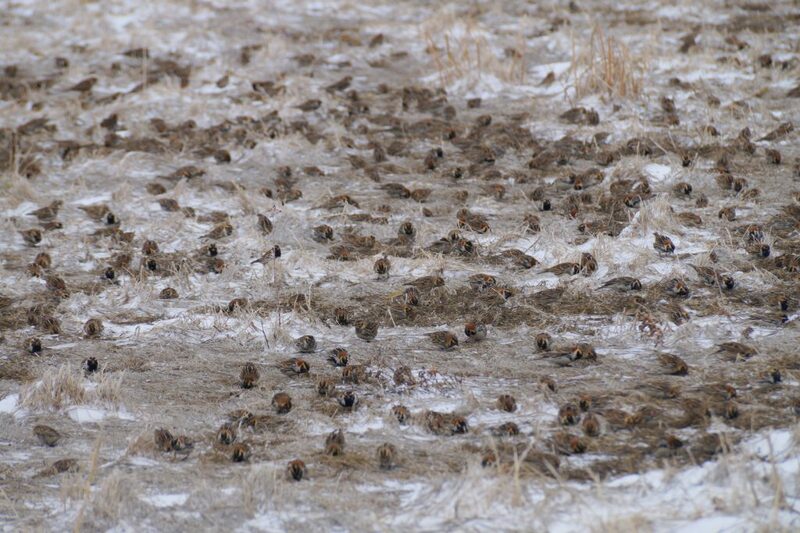 Winter: Lapland Longspurs occur statewide in winter, often with Horned Larks, but in pure flocks also, especially when large numbers are present. Both Rosche (1982) and Thompson and Ely (1992) refer to the propensity for large numbers to congregate over towns during snowfalls. The largest flocks occur in the west; Rosche (1982) stated that peak numbers in the northwest are found in wheat stubble and sugar beet fields near Alliance and Hemingford in Box Butte Co. This species moves around during the winter in response to variations in extent of snow cover, resulting in the large variation in numbers from year to year. CBC data reflect this; in the period 1900-2015 the high CBC count was 23,982 in 1978-1979, 23,452 of these at Lincoln 17 Dec 1978. The Lincoln birds were in mixed flocks with Horned Larks and were “gone by January” (Cortelyou 1979), suggesting that migration or at least significant movement is still in progress in mid-Dec. During the 1900-2015 period, all but three CBCs reported fewer than 15 birds per party-hour. High counts: 50,000 in Dodge Co 16 Jan 1999, 50,000 there 16 Dec 2009, 50,000 in Seward Co 10 Feb 2013, 36,000 near Funk, Phelps Co 28 Jan 2011, 10,000 in Dixon Co 20 Feb 1997, and 9050 in Deuel Co 5 Feb 2000. Lapland Longspurs near Mead, Saunders Co 15 Apr 2018. Photo by Joel G. Jorgensen. Photograph (top) of a Lapland Longspur at east of Wahoo, Saunders Co 28 Feb 2008 by Phil Swanson. Cortelyou, R.G., 1979. 1978 Christmas Count. NBR 47: 33-38. Hussell, D.J., and R. Montgomerie. 2002. Lapland Longspur (Calcarius lapponicus), version 2.0. In The Birds of North America (A. F. Poole and F. B. Gill, Editors). Cornell Lab of Ornithology, Ithaca, New York, USA. https://doi.org/10.2173/bna.656.